» Black Squirrel Books » You Stink! There are countless volumes celebrating the best teams in professional baseball. Unfortunately, winning represents only one side of the game. For every champion’s record-setting season, there has been an equally memorable story of defeat. These teams and their shameful contributions to America’s national pastime have been a neglected topic in the annals of baseball history. Until now. 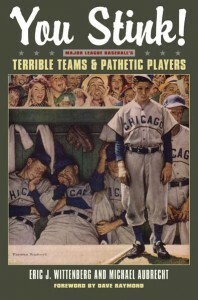 In You Stink!, two fanatical historians (or historian fans), Michael Aubrecht and Eric Wittenberg, give credit where it is far overdue with a statistically backed, satirical look at the worst teams and individuals ever to set foot on a diamond. You Stink! 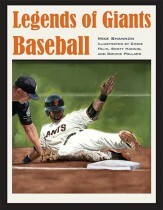 includes franchise origins, detailed stats, player profiles, photos, and more, as well as a collection of long-format essays in a “Hall of Shame” that recognizes some of the worst moments ever witnessed on a ball field. The first half of the book is based entirely on statistical data; in the second half the authors give their personal opinions. With an insightful foreword by Dave Raymond, the original “Phillie Phanatic,” You Stink! showcases disappointments on the diamond dating as far back as 1889. Readers are treated to stories of the worst teams, players, owners, calls, fans, plays, and more. A timeline of Major League terribleness and an assortment of quotations about losing complement this unique survey of shame. Ultimately, You Stink! celebrates a sport that gives us more than just wins and losses and drives to the heart of what all of us love about baseball. Fans bond with their teams, and everyone can relate to suffering through slumps. Watching our heroes stumble through ineptitude, boneheaded plays, and heartbreaking losses makes the celebration all the sweeter when victory finally comes. Visit the You Stink! blog for more pathetic terribleness. Eric J. Wittenberg is a lifelong Philadelphia Phillies fan and native of southeastern Pennsylvania. Having grown up in the early 1970s, he understands losing baseball teams. He is a lawyer in pri- vate practice and an award-winning Civil War historian. He and his wife Susan reside in Columbus, Ohio, where he struggles to follow his beloved Phillies. Michael Aubrecht has dedicated his studies to the histories of Major League Baseball teams, the Civil War, and the American Revolution. He has written multiple books, as well as hundreds of articles for publications including Baseball Almanac. He produced the documentary “The Angel of Marye’s Heights” and is vice chairman of the National Civil War Life Foundation. 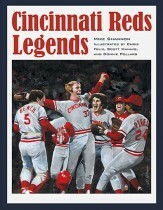 Click here to hear a lively May 18, 2012, interview with the authors on SportsTalk on the TribLIVE.com Podcast. Click here to listen to Mike Silva’s May 27, 2012, New York Baseball Podcast interview with the authors of You Stink! The interview begins at 35:25.